Microsoft as always been to me “the” partner-friendly company any B2B Digital Marketer could dream off. One of the largest partner ecosystem on earth with 600 000-plus members and probably the most mature partner program in the industry (MPN), combined with a promising new CEO vision. A friend of mine, my “insider”, who has worked there for years now, has confirmed to me the new dynamic and great potential there. That was it! My decision was made. It was time for me to move on. Since no relevant job for me were listed on the company website, I decided to take an alternative path by finding an executive sponsor that could help me identify the right opportunity. After using LinkedIn Search features combined with some online researches, I did find someone that would match my area of expertise (let’s call her “Ms. X”). Currently WW Director of Channel Marketing at PTC, I am responsible for setting-up and rolling-out the marketing strategy for our partners globally. Greatly interested by the new dynamic within Microsoft (i.e. Azure Cloud, reloaded partner strategy, CEO vision) and considering your role as the [Job Role], I would like to discuss with you regarding upcoming channel marketing opportunities that could raise inside your organization. Would you be available to discuss at your earliest convenience? I eventually got a reply 15 days later. She was thanking me for making the connection and due to busy agenda, asked me to send to her professional email my resume and few lines on what I was looking for. 2 months after, I got my first interview, followed by 2 additional ones. Each of the 3 interviewers asked me how I knew Ms. X. This is when I realize the importance of making the right connection at the right level, as she had forwarded my resume internally. It was just a game changer. I did get through the interview process which confirmed my strong motivation to join Microsoft. My « insider friend » who happened to be an ex-colleague as well send a recommendation email to my potential new boss, to confirm I would fit in the job and in the company culture. In April 2016, I was in, thanks to a real motivation, the strong support from my insider friend, the connection with the right executive sponsor (I’d like to thank her particularly as she has been very kind and supportive all the way! ), my manager who believed in me, and of course some luck! Update your profile: LinkedIn is your living resume, so update it, make sure you summarize on your profile what set you aside, get recommendations to validate your past experiences, set a professional profile picture, etc. LinkedIn has a great step-by-step enhancement feature called Profile Strength that let you optimize your page. Do not reach out to anyone until you reach 90-100% of profile completion. Get an insider: A champion inside the company who could share the culture and values, insights on the company strategy, and on the job role. Stick to your field of expertise: If you have spent 10 years in channel marketing but want to become a finance officer, you have better chance to get into those large corporations as a channel marketer. Beauty if that those corporation encourage internal moves if you desire, with the right training and learning paths associated. But they will hire you for your expertise and your attitude (but I am not an HR guy, so will let that topic to HR experts 😊). The right place: LinkedIn for me was a no brainer, being a “B2B digital marketer”, but a photographer would probably have better chance to be discovered showcasing his art on Instagram… Find the right place for you. Get an executive sponsor – Someone in your area of expertise! Make the message personalized (why should they care about your application), to the point (those people are bombarded by unsolicited messages), relevant (do your skills match their area of expertise and responsibilities), and ideally try to reference someone you have in common (a very important factor in social selling). Be smart : You have one shot only. Do not send “reminder InMail” if the person did not respond to you. Identify a handful of strategic contacts at most, do not spam the entire company or you will just get marked as a desperate person and it could impact your reputation. At the end of the day, all the resumes fall on HR desk, so do not gamble your chance by spamming employees. About the timing: I was lucky enough that Microsoft got a job opening that was matching my area of expertise. You will for sure increase your chance of success by applying to an existing job opening, but don’t just rely on those websites. We are in a fast-moving market and opportunities raise every day! Here at Microsoft, we do have Social Selling initiatives, but Social Selling is not just about selling to your customer base or finding new customers, it is also a fantastic way to sell yourself, using very basic Social Selling tactics 😊. Today, I help Microsoft partners transform and digitalize their marketing strategy, which includes rolling-out Social Selling programs, training and support to measure performance and business impact. Don’t know where to start? Measuring internally your SSI score against your colleagues can be a great first step to increase social engagement and employee-generated content, whether you are a marketing, technical or sales person. Let’s continue the conversation and join me on LinkedIn and twitter ! That’s all folks… for now 😊. PS: this article has not been endorsed by my HR department in anyway and could not guarantee any success joining Microsoft or any other company. This reflects my own experience only. Addicted to Social Media? Relax, it is not your fault. Another early morning where my wife caught me checking my phone while feeding my little baby girl. Now that she is 7 month-olds, she got some serious moves and a lot of energy which would actually require full attention. But some for reason, I just cannot resist checking on my iphone. Is the World getting mad? Looking at people walking on the street, one could easily realize how this phone addiction as spread across the city in the last decade. I am literally avoiding pedestrians looking at their phone while “piloting” my stroller. A research done by The Dscout found that average users spent 145 minutes on their phones and swap or tap their phone 2,617 times a day. Apple confirmed two years ago that a user on average was unlocking his iphone 80 times per day. Industry insiders believe it could be much more today, up to 150 times a day. And this issue does not stop on the sidewalks, it gets on the road too. 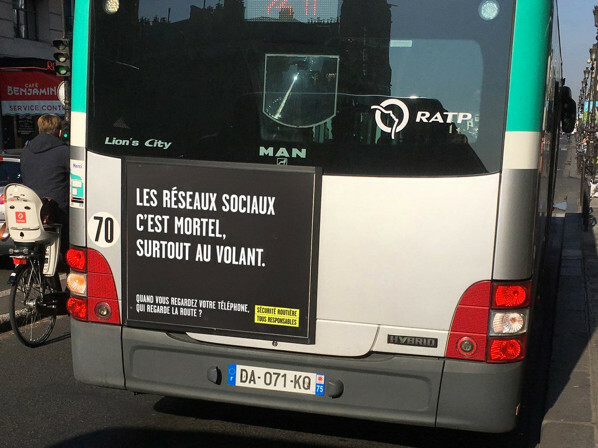 The issue, which also involves messaging and texting, is getting so serious that public authority in charge of road prevention in France has started a public campaign stating that using your phone while driving increases by 23 your risk of getting involved in a car accident. If this trend continues, self-driving car could not only be a breakthrough technology but could also very much be our life saver. So how come we just can’t resist grabbing our phone to text and check social media status, again and again? Congratulations, you have been hooked! Nir Eyal, conference organizer and author of “Hooked: How to build habit-forming products” describes on his book how the most successful companies design tech products we can’t put down. At the heart of the « Hook Model » is a variable schedule of rewards: a powerful hack that focuses attention, provides pleasure, and infatuates the mind. We all experience the effect of those variable rewards when using our favorite applications. Have you noticed this subtle good-feeling when someone retweeted you or liked your photo, the pleasure to scroll down and hunt for interesting yet unpredictable tweets, or the curiosity led by the uncertainty of friends’ posts that are liked and shared on your endless Facebook stream? All you have to do to access that interesting content is to keep scrolling, using the same psychology used when pulling the handle of a slot machine. It actually goes back to brain chemistry and a neurotransmitter playing a major role in reward motivated behavior called the dopamine. Every time you look at your unpredictable news feed or someone engage with your content, you receive a dopamine hit! The dopamine controls the release of various hormones, including the ones activating happiness. So, in a way, scrolling down your feed and interacting gives you a feeling of happiness. The most successful applications have been using those psychological triggers to hook users. Those malicious tricks are so powerful that we start seeing some social network executives expressing remorse, such as former Facebook President Sean Parker confessing last November that Facebook knew they were creating something addictive that exploited a vulnerability in human psychology. And what about this other Facebook executive Chamath Palihapitiya, stating during the same month that Social Media was ripping society apart? A little bit too dramatic one might say, but still worth noticing coming from people who built Facebook as we know it (and earned billions along the way). Actively interacting with people — especially sharing messages, posts and comments with close friends — is linked to improvements in well-being […] while passively consuming content was creating bad feeling and impacting negatively mental health. A self-serving study that clearly does not align with the seriousness required for such topic. It is probably time for independent studies at large scale to emerge and feed the debate that actually goes way beyond Facebook. Time to build technology on our values. Social media companies have increasing societal and moral responsibilities due to their global footprint and impact on people’s life. It actually does not stop at social media. Psychologist Sherry Turkle demonstrates that the phone itself has redefined modern relationship, making us “alone together”. Ok, now time for me to unplug and feed my baby girl, she deserves my full attention :-). Don’t forget to like, comment and share my post and let’s continue the conversation on LinkedIn and twitter, so that I can get my hit of dopamine! After all, I am addicted, but it is not my fault. Publié parcdonzel75 25 février 2019 Publié dansNon classéÉtiquettes : #ItCanWait, dopamine, facebook, phone, Social Media, Time Well SpentLaisser un commentaire sur Addicted to Social Media? Relax, it is not your fault. Do you have the feeling that you don’t get the attention you deserve online, that your website does not get the right traction, that your content marketing effort does not pay off, and that your website is so confidential that even your mum would not be able to find it? Getting attention from your mum is easy. Getting attention from the right B2B customers is increasingly difficult and time consuming as prospects got more choices in any given product or service. According to Accenture, 94% of B2B buyers conduct online research during the buying process. Challenge for you is to get noticed at the right time and stay above the crowed. We are in 2017, and yet your company website remains your most valuable digital asset. So here it is… the top 6 reasons even your mum would (digitally) ignore you… and what to do about it! In the digital world, your address remains your website (Facebook could be an alternative for some businesses). This is where Search Engine Optimization (SEO) kicks-in. SEO is a well-known, well-documented topic. But it’s constantly evolving. Google for instance changes its search algorithm around 500–600 times a year! Make sure you regularly test and optimize your ranking. And because you love your mum as well, make sure you get listed on first result page (SERP #1) or you might simply lose her (and of course you don’t want that, do you?). Like your mum, almost every B2B buyer has a smartphone… They might not all share stories on Instagram just yet or live stream from Facebook, but they have a smartphone, and they are connected. How easy would it be for them to find your website on mobile? Since April 2015, due to the raise of internet usage on mobile, Google has started to expand its use of mobile-friendliness as a ranking signal. In other words, get your website mobile-friendly or you will lose web traffic and friends sent by Google, Bing or Yahoo. The explanation? The same year, for this first time in the young history of mobile web, more searches took place on mobile devices than on computers. Looks like everyone moved to mobile, your mum included! How is your website looking on a tiny screen? Having a mobile friendly website is a must, but that’s not all. It also needs to load fast. Mobile users do not like to wait for a web page to load, particularly when they rely on their telco network. Google knows it and will now penalize you if your page speed time is too slow. Be a good kid and respectful of your mum’s time! Your To-Do: Is your website fast enough? Your mum loves to get fresh news from you, so does your 2B2 buyer. Give them a chance to come and visit you regularly. Create content often, change the format regularly, give opportunities for live interactions (live & twitter chats, webcast with Q/A, live events). Keep the conversation flowing, engage, and give a good reason to come back and visit you! Research shows that B2B companies that blogged 11+ times per month had almost 3x more visitors than those blogging 0-1 times per month. It is never too late to setup a blog platform, build a content calendar, identify and empower your most active employees, give them visibility, reward them and measure the ROI (# of posts, engagement, visitors, leads, sales requests). Your sales and technical audiences are the most knowledgeable people in your organization. They know their customers, and they know how to address their pain points, their industry challenges. Encourage them to write about it. Oh, and BTW, Google loves fresh content. Your To-Do: Get a blog and start writing! Reason #5 – There is No Way to Say Hi! Having website visitors is great, but knowing who is visiting you is even better (so that you don’t try to sell your mum your latest product…). Make sure you give enough valuable materials so that your most serious visitors will want to fill-in a form and share their contact details with you. Produce high quality content and setup a couple of landing pages with forms to build your database of contacts. Think about inbound marketing strategy, customer journey, lead scoring and start building your plan, then create your assets following your marketing personas. Your To-Do: Get an agency to help you out create content. Reach out to me if you’d like me to recommend a few. Linkedin study shows that 8 out of 10 B2B decision makers use social media during purchase process. They are also more influent, have more budget and buy more frequently. Those are the ones you want to work with. Meet them where they are and engage the conversation! Then invite them to consume your digital assets on your website. And don’t forget to make a quick phone call to your mum and tell her how much you love her, in the real world! clementdonzel.com, Fièrement propulsé par WordPress.